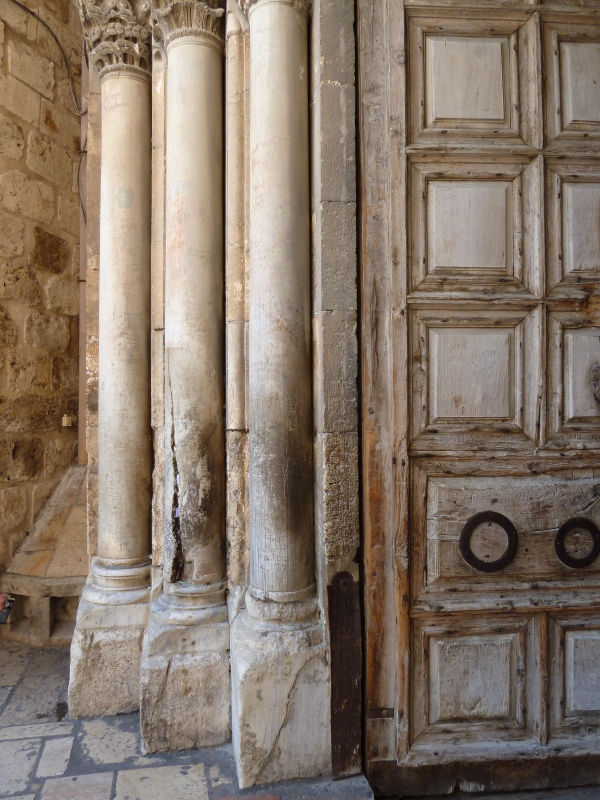 The video below chronicles the struggle of a film crew to gain entrance to the Holy Sepulcher, and records the miracle and scenes from the Paschal (Passover) Resurrection Service at the Holy Sepulcher. What is the Miracle of the Holy Fire? When and where does it occur? 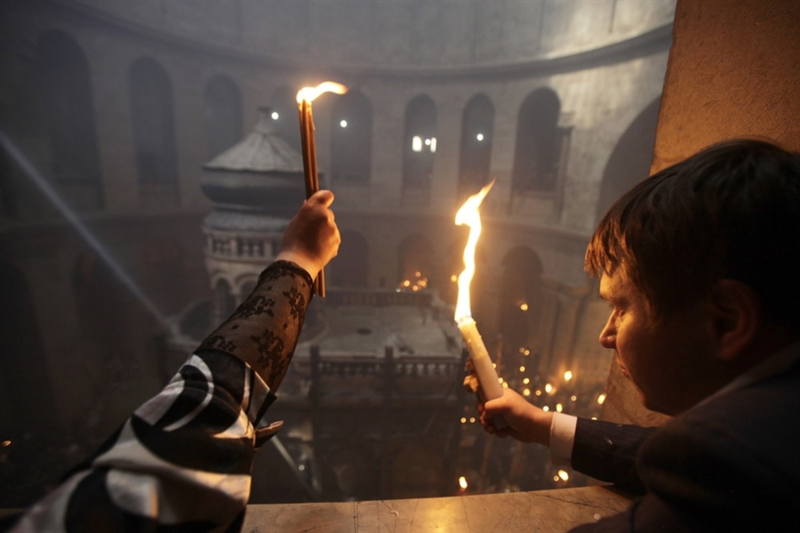 The ceremony, which awes the souls of Christians, takes place in the Church of the Resurrection in Jerusalem. 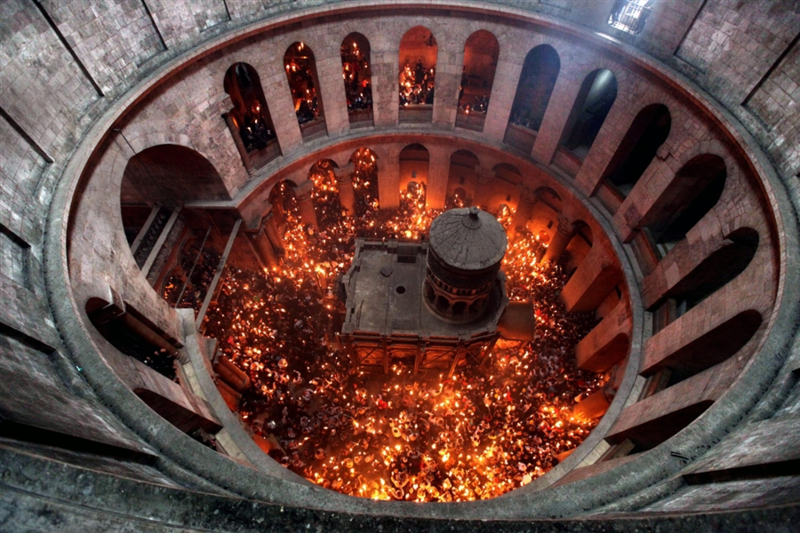 The Holy Fire is the most renowned miracle in the world of Orthodox Christianity. It has taken place at the same time, in the same manner, in the same place every single year for centuries. No other miracle is known to occur so regularly and so steadily over time. No other miracle is known to occur so regularly and so steadily over time. It happens in the Church of the Holy Sepulchre in Jerusalem, the holiest place on earth, where Christ was crucified, entombed, and where He finally rose from the dead. In order to be as close to the Sepulchre as possible, pilgrims camp next to it. The Sepulchre is located in the small chapel called Holy Ciborium, which is inside the Church of the Resurrection. Typically they wait from the afternoon of Holy Friday in anticipation of the miracle on Holy Saturday. Beginning at around 11:00 in the morning the Christian Arabs chant traditional hymns in a loud voice. These chants date back to the Turkish occupation of Jerusalem in the 13th century, a period in which the Christians were not allowed to chant anywhere but in the churches. “We are the Christians, we have been Christians for centuries, and we shall be forever and ever. Amen!” – they chant at the top of their voices accompanied by the sound of drums. The drummers sit on the shoulders of others who dance vigorously around the Holy Ciborium. But at 1:00 pm the chants fade out, and then there is a silence. A tense silence, charged from the anticipation of the great demonstration of God’s power for all to witness. Shortly thereafter, a delegation from the local authorities elbows its way through the crowd. At the time of the Turkish occupation of Palestine they were Muslim Turks; today they are Israelis. Their function is to represent the Romans at the time of Jesus. The Gospels speak of the Romans that went to seal the tomb of Jesus, so that his disciples would not steal his body and claim he had risen. In the same way the Israeli authorities on this Holy Saturday come and seal the tomb with wax. Before they seal the door, they follow a custom to enter the tomb, and to check for any hidden source of fire, which would make a fraud of the miracle. I enter the tomb and kneel in holy fear in front of the place where Christ lay after His death and where He rose again from the dead. I find my way through the darkness towards the inner chamber in which I fall on my knees. Here I say certain prayers that have been handed down to us through the centuries and, having said them, I wait. Sometimes I may wait a few minutes, but normally the miracle happens immediately after I have said the prayers. From the core of the very stone on which Jesus lay an indefinable light pours forth. It usually has a blue tint, but the color may change and take many different hues. It cannot be described in human terms. The light rises out of the stone as mist may rise out of a lake — it almost looks as if the stone is covered by a moist cloud, but it is light. This light each year behaves differently. Sometimes it covers just the stone, while other times it gives light to the whole sepulchre, so that people who stand outside the tomb and look into it will see it filled with light. The light does not burn — I have never had my beard burnt in all the sixteen years I have been Patriarch in Jerusalem and have received the Holy Fire. The light is of a different consistency than normal fire that burns in an oil lamp… At a certain point the light rises and forms a column in which the fire is of a different nature, so that I am able to light my candles from it. When I thus have received the flame on my candles, I go out and give the fire first to the Armenian Patriarch and then to the Coptic. Hereafter I give the flame to all people present in the Church. The Holy Light is not only distributed by the Archbishop, but operates also by itself. It is emitted from the Holy Sepulchre with a hue completely different from that of natural light. It sparkles, it flashes like lightning, it flies like a dove around the tabernacle of the Holy Sepulchre, and lights up the unlit lamps of olive oil hanging in front of it. It whirls from one side of the church to the other. It enters some of the chapels inside the church, as for instance the chapel of the Calvery (at a higher level than the Holy Sepulchre) and lights up the little lamps. It lights up also the candles of certain pilgrims. In fact there are some very pious pilgrims who, every time they attended this ceremony, noticed that their candles lit up on their own accord!his divine light also presents some peculiarities: As soon as it appears it has a bluish hue and does not burn. At the first moments of its appearance, if it touches the face, or the mouth, or the hands, it does not burn. This is proof of its divine and supernatural origin. We must also take into consideration that the Holy Light appears only by the invocation of an Orthodox Archbishop. The miracle is not confined to what actually happens inside the little tomb, where the Patriarch prays. What may be even more significant, is that the blue light is reported to appear and be active outside the tomb. Every year many believers claim that this miraculous light ignites candles, which they hold in their hands, of its own initiative. All in the church wait with candles in the hope that they may ignite spontaneously. Often unlit oil lamps catch light by themselves before the eyes of the pilgrims. The blue flame is seen to move in different places in the Church. A number of signed testimonies by pilgrims, whose candles lit spontaneously, attest to the validity of these ignitions. The person who experiences the miracle from close up by having the fire on the candle or seeing the blue light usually leaves Jerusalem changed, and for everyone having attended the ceremony, there is always a “before and after” the miracle of the Holy Fire in Jerusalem. The Russian abbot Daniel, in his itinerary written in the years 1106-07, presents the “Miracle of the Holy Light” and the ceremonies that frame it in a very detailed manner. He recalls how the Patriarch goes into the Sepulchre-chapel (the Anastasis) with two candles. The Patriarch kneels in front of the stone on which Christ was laid after his death and says certain prayers, at which point the miracle occurs. Light proceeds from the core of the stone – a blue, indefinable light which after some time kindles unlit oil lamps as well as the Patriarch’s two candles. This light is “The Holy Fire”, and it spreads to all people present in the Church. 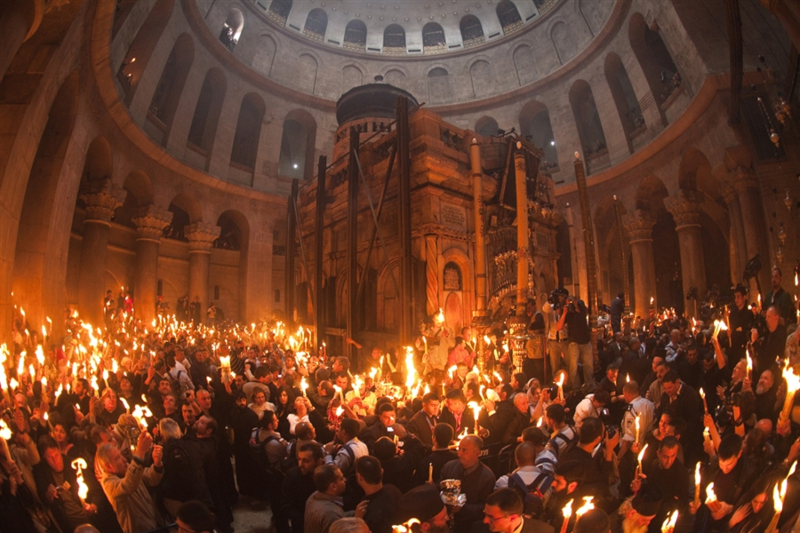 The ceremony surrounding “The Miracle of the Holy Fire” may be the oldest unbroken Christian ceremony in the world. From the fourth century A.D. all the way up to our own time, sources recall this awe-inspiring event. From these sources it becomes clear that the miracle has been celebrated on the same spot, on the same feast day, and in the same liturgical frame throughout all these centuries. Every time heterodox have tried to obtain the Holy Fire they have failed. Three such attempts are known. Two occurred in the twelfth century when priests of the Roman church tried to force out the Orthodox church but by their own confession these ended with God’s punishment. But the most miraculous event occured in the year 1579, the year when God clearly testified to whom alone may be given His miracle. 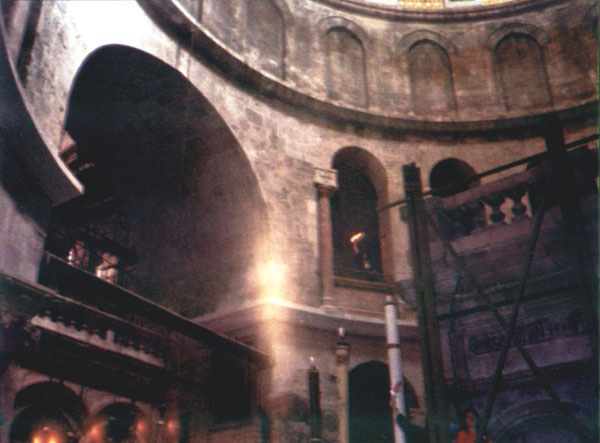 Once the Armenians paid the Turks, who then occupied the Holy Land, in order to obtain permission for their Patriarch to enter the Holy Sepulchre, the Orthodox Patriarch was standing sorrowfully with his flock at the exit of the church, near the left column, when the Holy Light split this column vertically and flashed near the Orthodox Patriarch. The split column still exists. It dates from the twelfth century. The Orthodox pilgrims embrace it at the “place of the split” as they enter the church. Turkish warriors stood on the wall of a building close to the gate and lightning-struck column . When he saw this striking miracle he cried that Christ is truly God and leaped down from a height of about ten meters. But he was not killed-the stones under him became as soft as wax and his footprint was left upon them. The Turks tried to scrape away these prints but they could not destroy them; so they remain as witnesses. He was burned by the Turks near the Church. His remains, gathered by the Greeks, lay in the monastery of Panagia until the 19th century flowing myrhh. In 1187, the Saracens under the direction of Sultan Salah ad-Din took Jerusalem. In that year, the Sultan desired to be present at the celebration, even though he was not a Christian. Gautier Vinisauf tells us what happened: “On his arrival, the celestial fire descended suddenly, and the assistants were deeply moved…the Saracens… said that the fire which they had seen to come down was produced by fraudulent means. One can ask the question of why the miracle of the Holy Fire is almost unknown in Western Europe? In Protestant areas it may, to a certain extent, be explained by the fact that there is no real tradition of miracles; people don’t really know in which box to place the miracles, and they rarely feature in newspapers. But in the Catholic tradition there is vast interest in miracles. Thus, why is it not more well known? For this only one explanation suffices: Church politics. Only the Orthodox Churches attend the ceremony which is centered on the miracle. 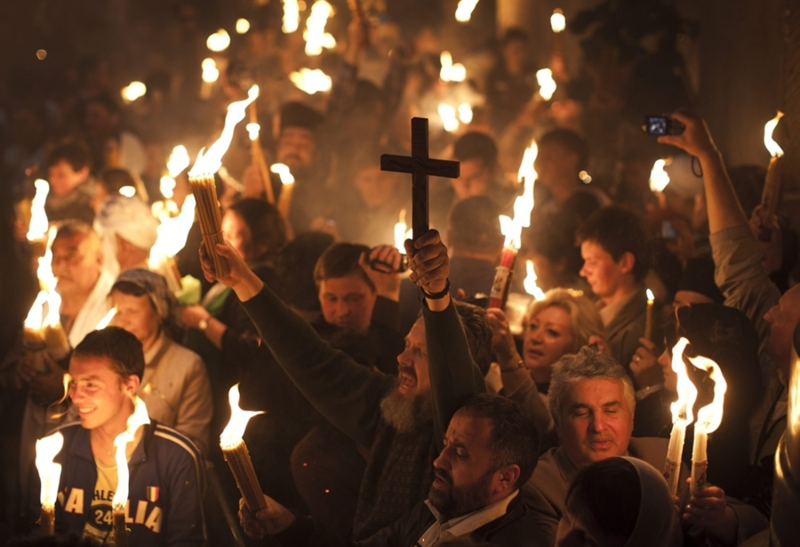 It only occurs on the Orthodox date of Easter and without the presence of any Catholic authorities. As with any other miracle there are people who believe it is a fraud and nothing but a masterpiece of Orthodox propaganda. They believe the Patriarch has a lighter inside of the tomb. These critics, however, are confronted with a number of problems. Matches and other means of ignition are recent inventions. Only a few hundred years ago lighting a fire was an undertaking that lasted much longer than the few minutes during which the Patriarch is inside the tomb. One then could perhaps say, he had an oil lamp burning inside, from which he kindled the candles, but the local authorities confirmed that they had checked the tomb and found no light inside it. The best arguments against a fraud, however, are not the testimonies of the shifting Patriarchs. The biggest challenges confronting the critics are the thousands of independent testimonies by pilgrims whose candles were lit spontaneously in front of their eyes without any possible explanation. According to our investigations, it has never been possible to film any of the candles or oil lamps igniting by themselves. However, I am in the possession of a video filmed by a young engineer from Bethlehem, Souhel Nabdiel. Mr. Nabdiel has been present at the ceremony of the Holy Fire since his early childhood. In 1996 he was asked to film the ceremony from the balcony of the dome of the Church. Present with him on the balcony were a nun and four other believers. The nun stood at the right hand of Nabdiel. On the video one can see how he films down on the crowds. At a certain point all lights are turned off – it is time for the Patriarch to enter the tomb and receive the Holy Fire. While he is still inside the tomb one suddenly hears a scream of surprise and wonder originating from the nun standing next to Nabdiel. The camera begins to shake, as one hears the excited voices of the other people present on the balcony. The camera now turns to the right, whereby it is possible to contemplate the cause of the commotion. A big candle, held in the hand of the Russian nun, takes fire in front of all the people present before the patriarch comes out of the tomb. She holds the candle with shaking hands while making the sign of the Cross over and over again in awe of the miracle she has witnessed.